When I was in high school, I read this dark science fiction novel by Piers Anthony entitled The Ring. In this work, the author (who is most famous for his fantasy) presents us with a world full of gyrocars, one-passenger vehicles that somehow rode on just one wheel. 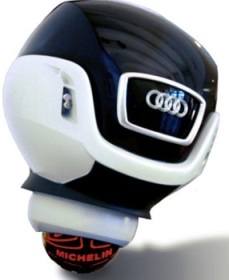 I don’t know if Tilmann Schootz, German designer of the Audi Snook, has ever read The Ring, but it certainly looks like his inspiration for his auto-stabilized monowheel concept car. Maybe the bright idea light bulb went off above his head, and he designed his car in the shape of it. Whatever the case, Schootz has won a Michelin Challenge Design Award at the 2008 Detroit Auto Show for his vision. You may look at the Snook and think “that’s impossible” or “there’s no way that could stand” or “I’m not driving that”. However, I believe we were all thinking the same things when the Segway was revealed. The Snook achieves its one-wheel balance with “agility through instability, controlled by artificial intelligence”. If this concept ever does become reality, then we really need to change the name. Just what is a Snook? That sounds like some creature on a Saturday Morning cartoon. The only Snook I know of is a fish. Looks nothing like a fish! Looks like the coolest thing, and definitely fun to drive. A few questions: how do I park it in the streets? How does it work on slippery surfaces? In the Nordic countries up to 4 months a year there is cold and snow. What about gravel and mud roads? And how fast does it emergency stop? I guess corners are taken a bit like a motorbike.